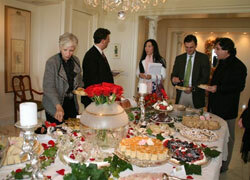 Symphony 100 is an exclusive membership group that offers adult music education classes and several unique events or field trips available only to members. Membership is limited to 100 women, who support special projects of the Symphony through an annual contribution of $1,000. 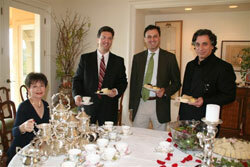 On February 26, Symphony 100 held an elegant high tea at the beautiful home of Symphony 100's President, Darrellyn Melilli. The event provided the opportunity to meet and chat with the two guest artists, composer Richard Danielpour, one of the most honored composers of his generation; and highly revered pianist Jeffrey Biegel. Guests learned how a world premiere comes to life for an orchestra. Pacific Symphony commissioned Danielpour to compose a work, Mirrors for Piano and Orchestra, which was performed as a world premiere on February 25, 26 and 27 by Biegel and Pacific Symphony. Danielpour defined his "top down" process of composing Mirrors and also the origins of themes of the five movements. Biegel played a little of each of the movements to explain the personalities portrayed. Danielpour shared his heartfelt respect and admiration for Carl St.Clair as a world renowned conductor; he proclaimed his belief that the Pacific Symphony is one of the three greatest orchestras in the country. Symphony 100 members enjoy a special affiliation with the Pacific Symphony and plan activities each year offering music education and appreciation events. The revenues from Symphony 100 memberships provide support for concert sponsorships each season. For additional information regarding the Symphony 100, contact Nikki Palley at (714) 876-2365.